Just a month and a half after Australian National Bacon Week, another type of foodie fever recently struck Sydney’s inner west. Truffle mania gripped Black Star Pastry on August 8 and 9, spawning truly luxurious truffle-infused treats. Before we move on to the review, you may be wondering what the big deal about truffles is. Hailing from the fungi family, one could think of them as the humble mushroom’s loud, over-the-top, show-off cousin. On the outside, they look downright drab– like a black, white, or pale gray cluster of lumpy dirt– but don’t let appearances fool you. They pack a senses-busting, joyful tear-in-the-eye-inducing flavor punch that equally complements sweet and savory food. It’s a difficult taste to describe; the best I can manage is that it has a heavy, earthy base note of brown mushrooms, lit up by the aromas of vanilla, rosewater, lavender, apricots, olive oil, and a hint of honey. But enough of the technicalities– let’s get right on to admiring this food! Without the need for Spider-Man’s extraordinary senses, I could pick up the truffle content of this tart right off the bat. It left a scant little trail of gooey caramel when Dad transferred it from its box to a serving plate; said caramel trail was promptly mopped up with my finger, and tasted. The familiar truffle fragrance and flavor came in a huge rush, like a gleeful hug from an old friend. 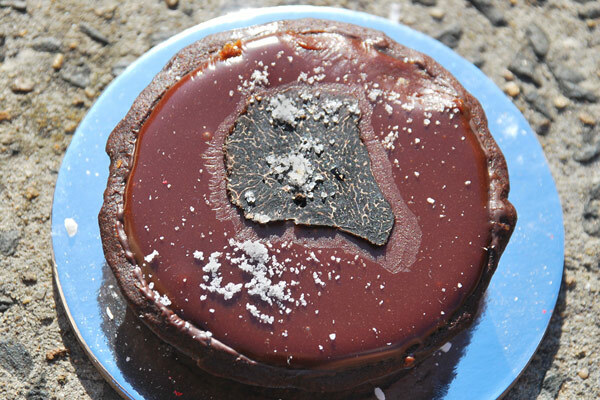 Aside from the generous shaving of black truffle on top, the center of the tart contained a piece of black truffle– the reason for the caramel’s lovely perfume and flavor. Both the caramel and dark chocolate layers had just the right balance of salt and sweetness, and were impeccably smooth on the tongue. The only letdown was the crust: although it was wonderfully buttery with a mellow cocoa flavor, it was too thick on the bottom, making the tart rather difficult to eat. I’m going to be a bit of a linguistics nut here: “Croquembouche” technically isn’t the right term for this dessert, as the word refers to an assembly of multiple pastry puffs with cream filling. Examples of a more correct term would be “cream puff”, “choux pastry”, or “profiterole” (anything that denotes a single item, not a collection of pastries). That said, I quite enjoyed this dessert more than the previous one. In contrast to the near-impenetrable crust of the Truffle Salted Caramel and Chocolate Tart, this one had a beautifully light and thin pastry exterior, enhanced by a coating of bittersweet crackly caramel. Sugary crunchy chewiness gave way to magnificently fragrant, truffle-spiked custard cream (call it creme patissiere, if you want to be a linguistics nut too). 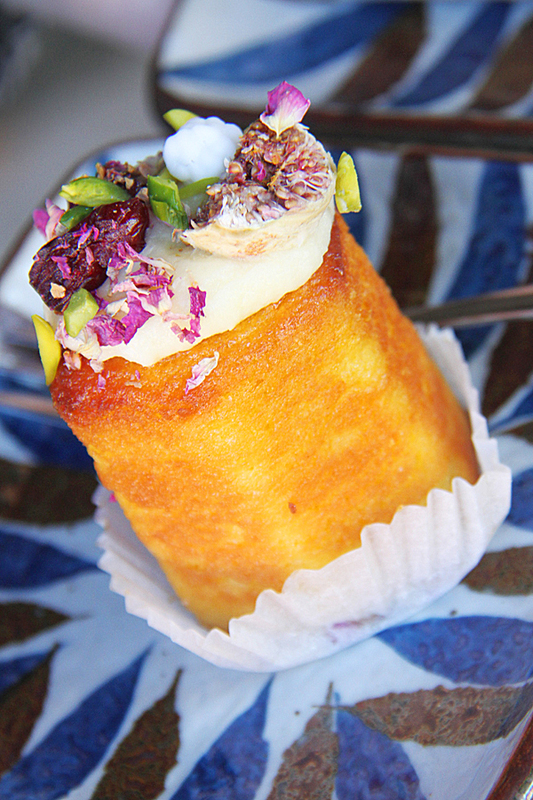 There were flecks of tangy dried raspberry, aromatic dried rose petals, and a few slivers of pistachio on the outside as well; they balanced out the sweetness excellently. So melt-in-the-mouth delicious, this dessert was gone all too soon; I wished I’d bought more. Perhaps the bakery’s flagship dessert, this confection delivered multiple waves of refreshing fruity flavor and contrasting textures. The slice in the photo may look quite thick and substantial, but in actuality it was extremely light and delicate. This one was both a hit and a miss. It had most of the elements of a great carrot cake: a soft and light texture, a bit of hearty crunch from finely chopped and toasted walnuts, a tiny hint of warm zing from cinnamon and nutmeg, and of course generous amounts of delicious shredded carrot. Unfortunately this particular batch of cake was rather dry; even the smooth, luscious cream cheese frosting didn’t fully alleviate the situation. The flavors of the cake somewhat drowned out the dried raspberry, flaked coconut, and lavender seed toppings, along with the walnut chunks, which became lost among the cake’s overall walnut content. The big flake of dehydrated carrot didn’t add anything either; Mom found it totally without flavor, not even a hint of carrot sweetness. It did look quite pretty, though. Despite the dryness being a letdown, I’m willing to give this cake another go sometime. Hopefully this dry piece was just a one-off occurrence– with the right amount of moistness, this Carrot Cake would be a sure winner. Nibbling on this cake was like frolicking outdoors on a cheery, sunny morning. It was full of juicy orange goodness– and no wonder, given that the Black Star Pastry website states that it’s made from whole oranges. Thankfully there were no large chunks of peel, seeds, or pith; these were so well incorporated that they blended right in with the moist, yielding cake. It was as close as one could get to eating a fresh, ripe Valencia orange. The cake was so moist and tasty that it didn’t need any further embellishment. However, as you can see, it was capped with a dollop of cream cheese icing, daintily hugging the cake with its silky, tangy sweetness. Adding to the fruit experience, there were zesty dried cranberries and bits of aromatic dried Persian fig. 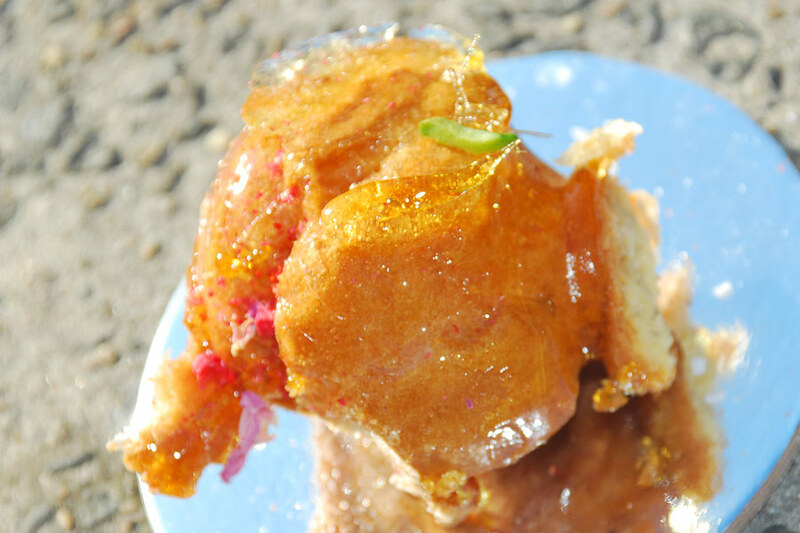 Their coarse, chewy textures contrasted pleasantly with the soft, syrup-doused cake. I found the dried Persian fig to be particularly intriguing; beneath the thin, papery skin was a cluster of miniscule, alluringly crunchy seeds in a somewhat pulpy interior, with the mellow aromas of honey and vanilla mingled with the usual fig flavor. Slivered pistachios provided a hint of crunch, while the dried rose petals became somewhat lost in the intense orange flavors (not really a bad thing). 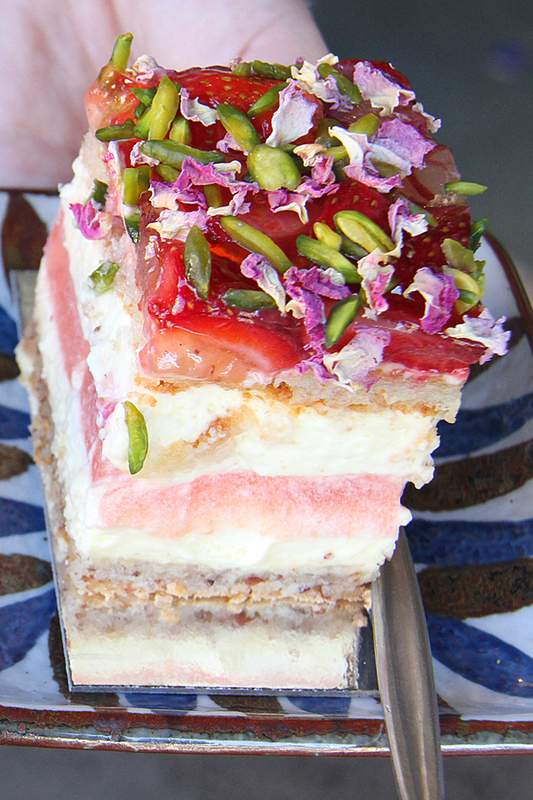 Black Star Pastry has branches in Rosebery and Newtown, New South Wales. 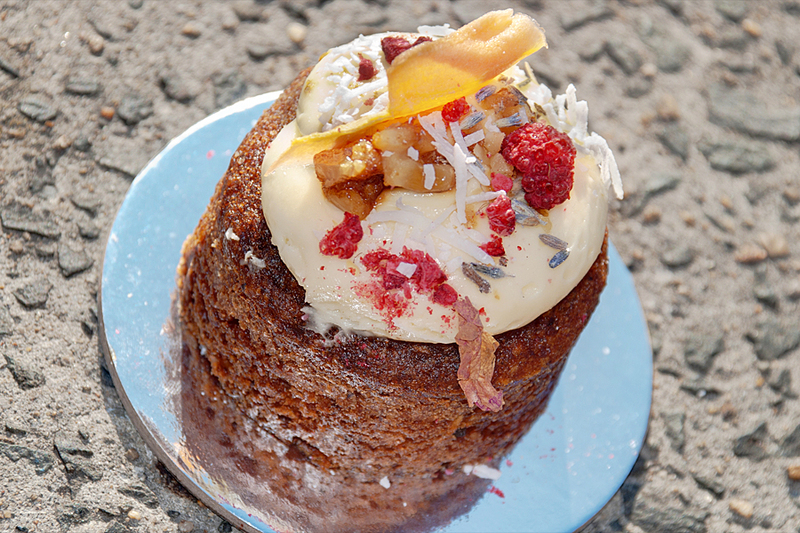 Visit their website for store addresses and “pop-up” store locations across Australia: http://blackstarpastry.com.au/ They’re a must-go for all lovers of cakes and pastries, both sweet and savory. We’ll be reviewing their savory selection sometime in the future, so watch this space!